Richard Meadow on Indus script! “Indus, The Unvoiced Civilization,” a video and following discussion, was presented in the Harvard Science Center on January 10. The lecture was sponsored by the Harvard Department of Sanskrit and Indian Studies in its ongoing Outreach lecture series on “Indian Society through the Ages.” The session was introduced by Dr. Bijoy Misra of the Outreach Committee, who outlined the progress of the series and summarized the lectures of the past months. Ms. Nalini Gopinath, who presented the video, first offered an overview of facts that have hitherto come to light about the long-forgotten Indus civilization. For a 900-year span from about 2600 BCE to 1700 BCE a sophisticated urban civilization flourished in the region of the Rivers Indus and Gagghar-Hakra, extending to south to modern Gujarat and east nearly to Delhi. The territory was rich in many kinds of flora and fauna, which are now extinct there. Crops such as wheat, barley, millets, sesame and cotton were cultivated. This sophisticated urban civilization had trading ties to Mesopotamia and the Arabian Peninsula. Seals bearing Indus characters have been found as far west as Abu Dhabi and Bahrain. These, together with a few Mesopotamian texts, point to a thriving trade between the Indus region and Western Asia. The DVD Presentation titled “Indus: The Unvoiced Civilization” lasted about one hour. It took the audience through the three most prominent sites – Harappa, Mohenja-Daro and Dholavira. It depicted the archeological finds, such as carnelian jewelry, pottery and seals. The urban centers of Harappa (Punjab), Mohenjo-Daro (Sindh), Dholavira (Gujarat), and Rakhigarhi (Haryana) as well as many smaller settlements reveal a concern for urban planning and sometimes include very sophisticated drainage and water storage systems. Mohenjo-daro, in particular, had many wells, while Dholavira was designed to channel rainwater into huge reservoirs. 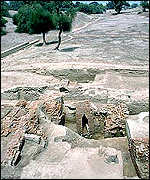 Harappa had both wells and tanks. It is speculated that as many as 40,000 people may lived in the city of Harappa and about 20,000 in Dholavira. The presentation was followed by a lively question and answer session with Dr. Richard Meadow, who appeared in the film and participated in the excavations of Harappa. The questions pertained to the script and the extent of the civilization. Dr. Meadow explained that a total of 400-600 characters have been identified from the various Indus inscriptions. No single inscription contains more than 17 characters. We do not know which language or languages were spoken in the Indus region. None of the many attempts which have been made to decipher the script have gained general acceptance. Sites of the civilization have been found as far as northern Afghanistan. Gaps in the archeological record do not permit us to speak of cultural continuity from the Indus civilization to the modern day, but many undeniable similarities suggest possible survivals. Why is the script not deciphered as yet? We do not know which language or languages were spoken in the Indus valley. We have no bilingual inscriptions, no known inscription of more than 17 characters, and no obvious successor script. There is a theory that the characters do not reflect spoken language but are non-linguistic symbols, although this is widely debated. How many characters have been identified so far? About 400-600, the larger number is arrived at by regarding some similar characters as being separate. How come there is so much evidence of trade out of the Indus region but no evidence of imported goods? It is speculated that imports were mainly perishable items like textiles, which have not survived. Why is there little evidence of tombs like those found in Mesopotamia and Western Asia? Although few tombs are known, there are some sites at which have been found a large number of burials, for example at Harappa and at Farmana (Haryana). There seems to be no evidence so far that the Indus people had very rich graves of the kind known in ancient Mesopotamia, Egypt, or China. One must also remember that the long-lived Indus civilization left extensive remains, still largely unexplored. So far, excavations have in general uncovered only the topmost third of the many sites. “We still have only a hazy picture of the earlier phases of the culture,” as represented by the lower levels at the archaeological sites. Why do archaeologists speak of a gap between the end of Indus culture and the beginning of the Vedic period, even though many of the Indus artifacts shown in the DVD are still in use today? It is true that many cultural traits and artifacts may survive from an earlier into a later period. But it is methodologically problematic to speak of archeological continuity without some evidence of survival of artifacts in the interval between the two periods. How far did the civilization extend? Sites of the Indus civilization are found almost to the border of Central Asia in the northwest, east almost to Delhi, south almost to Mumbai, and west nearly to the Iranian border as well as to coastal Arabia. Is it possible that some Indus people are buried in Western Asia in one of the 80,000 tombs found in Bahrain? Is it true that the British built the Indian Railway system using bricks from the Harappa site? The sites were always known to the local people. The British first became aware of Indus sites in the early 1800s. In the 1850s the Archeological Survey of India began to scout them. When the British built the Northwest Railway in the 1860s they used vast quantities of ancient bricks from Harappa to prepare the roadbed for the tracks. All have probably disintegrated by now. The ancient people of Harappa themselves recycled bricks, reusing old ones in new structures. What do the names Harappa and Mohenja-Daro mean? These are the names used by the local people and they may possibly be very old. There is no convincing explanation of their meaning. We do not know what the Indus people called themselves. Mesopotamian texts seem to refer to the Indus region as Meluhha. Where can we find the DVD? It’s a Japanese production and can be procured on the internet. Harvard affiliates can borrow it from Tozzer Library. The next lecture in the series will be “The Indus Civilization: Myth and Reality.” It will be presented by Dr. Richard Meadow of the Peabody Museum, Harvard University. 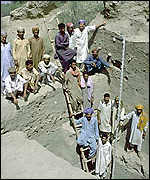 Dr. Meadow will note that while the Indus civilization has often been characterized as highly structured, uniform, and unchanging, in fact it was a highly diverse, varied, and dynamic cultural phenomenon with many different kinds of sites with strong local and region characteristics that changed over time. The lecture is scheduled for Sunday, 14 February in Hall A, Harvard Science Center, 1 Oxford Street, Cambridge, at 3.00 pm. Admission is free and all are invited. The first known examples of writing may have been unearthed at an archaeological dig in Pakistan. So-called ‘plant-like’ and ‘trident-shaped’ markings have been found on fragments of pottery dating back 5500 years. They were found at a site called Harappa in the region where the great Harappan or Indus civilisation flourished four and a half thousand years ago. Harappa was originally a small settlement in 3500 BC but by 2600 BC it had developed into a major urban centre. The earliest known writing was etched onto jars before and after firing. Experts believe they may have indicated the contents of the jar or be signs associated with a deity. 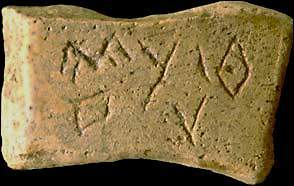 According to Dr Richard Meadow of Harvard University, the director of the Harappa Archaeological Research Project, these primitive inscriptions found on pottery may pre-date all other known writing. Last year it was suggested that the oldest writing might have come from Egypt. Clay tablets containing primitive words were uncovered in southern Egypt at the tomb of a king named Scorpion. They were carbon-dated to 3300-3200 BC. This is about the same time, or slightly earlier, to the primitive writing developed by the Sumerians of the Mesopotamian civilisation around 3100 BC. “It’s a big question as to if we can call what we have found true writing,” he told BBC News Online, “but we have found symbols that have similarities to what became Indus script. “One of our research aims is to find more examples of these ancient symbols and follow them as they changed and became a writing system,” he added. One major problem in determining what the symbols mean is that no one understands the Indus language. It was unique and is now dead. Dr Meadow points out that nothing similar to the ‘Rosetta Stone’ exists for the Harappan text. The Rosetta Stone, housed in the British museum since 1802, is a large slab of black basalt uniquely inscribed with the same text in both Egyptian hieroglyphs and Greek. Its discovery allowed researchers to decipher the ancient Egyptian script for the first time. The Harappan language died out and did not form the basis of other languages. “So probably we will never know what the symbols mean,” Dr Meadow told BBC News Online from Harappa. What historians know of the Harappan civilisation makes them unique. Their society did not like great differences between social classes or the display of wealth by rulers. They did not leave behind large monuments or rich graves. They appear to be a peaceful people who displayed their art in smaller works of stone. Their society seems to have petered out. Around 1900 BC Harappa and other urban centres started to decline as people left them to move east to what is now India and the Ganges. This discovery will add to the debate about the origins of the written word. It probably suggests that writing developed independently in at least three places – Egypt, Mesopotamia and Harappa between 3500 BC and 3100 BC.